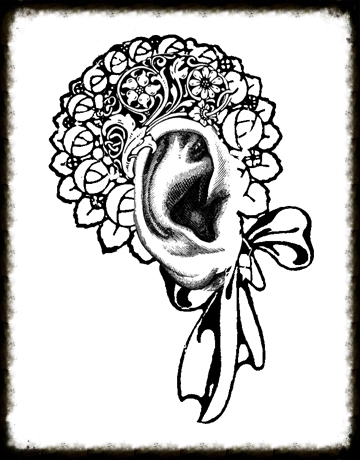 Check out the submission guidelines for our upcoming themed photo gallery documenting the lives of writers, "Written on the Body: Writers and Tattoos." like those found in mended bowl cracks. but relegated to the second-hand table. and back again, dull scales of sticky fingerprints. at every fumbled note, everyone smiling just the same. that could beg them to stop. But maybe that’s not why the flames started. that You take it away. and damned for feeling blessed that she’s gone. I’m under the impression that you can’t pray your way out of hell. no recorded lyric pleas to leave, to return. for release, only bombs, pleading to die by a stronger hand than their own. of blood for a while. smashed apple blossom and broken twigs. fell onto frozen ground, somewhere near East Pittsburgh. on her front porch, raised her V for victory legs like winter branches. and CAT scans of my brain— spidery river of missed connections. When I say, falling leaf, fiery red Maple, do I mean blood? touching? The no no of me, little tree, sapling, small root system. the reader could just reach out and touch it. My background as a psychotherapist and poet has influenced my photography as I search to capture a poetic sensibility in a subject, an energy that is not necessarily based in logic. I am mostly drawn to taking photos that I interpret as speaking to a deeper place, like moments in a dream. At the same time, I try to stay attuned to composition and light and their transformative effect on a subject. “Clown” was taken on the streets of New Orleans in 2014. 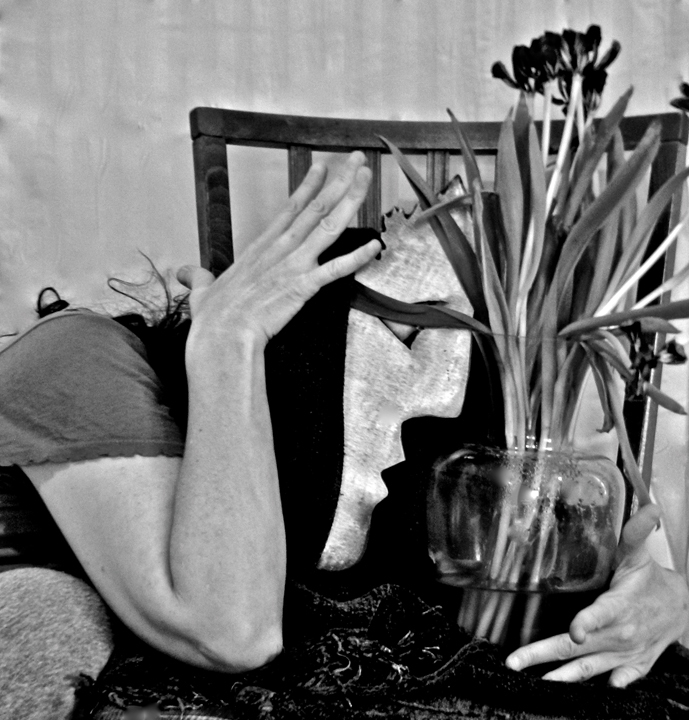 “Mask & Flowers” was taken as part of a larger series in my studio in Ossining, NY. serenely. Imbue gestures with a refined ambivalence. porcelain boxes carpeted with crimson velvet. that pure air. The eternity in it. beneath my mother’s right breast scared me: I sat on her bed with my dolls and peeked. black onyx peas you could finger as you prayed. and I rubbed and rubbed the hard nubby plastic with my thumb. to the wire that allowed my dolls to kneel. cawing: I saw! I saw! I saw! My hands slice the air between us into increasingly smaller portions. under the heat of various explosions. every sky has the stars it deserves. Surely by now you’ve learned not to expect grace. your skin flushed and my arms on your mind. I close another gap, another. The blasts are getting closer. Eyes forward. Refuse to look back. There is no other escape plan. the small things we’d avoided. I ran to the closet. This is a photograph of a clanging sound. The ink from his reef still stings fresh. The human skull is one of the most powerful and oldest iconic symbols know to man. It has been used in art for centuries and carries with it an array of diverse and sometimes overlapping interpretations and meanings. Skull imagery has been evident in some of history's most impactful art, from Jose Gaudalupe Posada to C. Allan Gilbert, Shakespeare to Pieter Claesz, Frida Kahlo to Damian Hirst. The death of my father has affected me immensely and has found its way into my work. The cluster of feelings and representations that are attributed to the skull have become the perfect vessel to convey my conflicts regarding life, death, and mortality. but not what’s in it. deborah brandon holds an MFA from the School of the Art Institute of Chicago (2004). Additional work appears in [PANK], Ocho, MiPOesias, Mom Egg Review, Hotel Amerika, Puerto del Sol, Denver Quarterly, Cream City Review, White Whale Review, and others, including a couple of anthologies. Jonathan Brooks' work was just part of a digital display at The Louvre Museum, is being used as decor in a Twentieth Century Fox film, was featured on the CW Network's The Vampire Diaries, and is available at West Elm. He recently attended Creative Capital Foundation's Professional Development Program Workshop at Florida State University in Tallahassee for artists who shape the future. The workshop was funded by The National Endowment for the Arts. Lauren Camp is the author of two collections. Her third book, One Hundred Hungers, won the Dorset Prize (Tupelo Press, 2016). Her poems appear in Slice Magazine, The Seattle Review, World Literature Today, Hobart, and other journals. Lauren is a Black Earth Institute Fellow, and winner of a Margaret Randall Poetry Prize and an Anna Davidson Rosenberg Award. She produces and hosts “Audio Saucepan”—a global music program interwoven with contemporary poetry—on Santa Fe Public Radio. www.laurencamp.com. Amy Strauss Friedman teaches English at Harper College and earned her MA in Comparative Literature from Northwestern University. She is a regular contributor to Newcity, and her work has appeared or is forthcoming in *82 Review, After the Pause, MelancholyHyperbole, Fractal, Extract(s), Crack the Spine, and elsewhere. Jennifer Martelli's chapbook, Apostrophe, was published in 2011 by Big Table Publishing Company. Most recently, her work has appeared in Up the Staircase Quarterly, Wherewithal, and Hermeneutic Chaos. She is a recipient of the Massachusetts Cultural Council Grant in Poetry and a Pushcart nominee. She is an associate editor for The Compassion Project: An Anthology and lives in Marblehead, Massachusetts. Find her on the web at www.jennifermartelli.com. Lorretta Oleck is a psychotherapist and creative artist with poetry and photography published in Feminist Studies, The Missing Slate, Obsidian, Word Riot, The Adirondack Review, The Stockholm Review of Literature, High Coupe, Right Hand Pointing, Cultural Weekly, Commonline Journal, The Westchester Review, Picayune Magazine, and Elohi Gadugi Journal, among numerous others. Emily O'Neill is a writer, artist, and proud Jersey girl. Her recent poems and stories can be found in inter|rupture, Powder Keg, and Tinderbox, among others. Her debut collection, Pelican, is the inaugural winner of Yes Yes Books' Pamet River Prize. She teaches writing at the Boston Center for Adult Education and edits poetry for Wyvern Lit. Elizabeth Onusko’s work has recently appeared or is forthcoming in Slice Magazine, Linebreak, The Journal, Vinyl, Radar Poetry, FrontPorch Journal, DIALOGIST, Tinderbox Poetry Journal, and The Adroit Journal, among others, has been nominated for a Pushcart Prize, and has been featured on Verse Daily. She is a founding editor of Guernica. Robert Walicki's debut chapbook is A Room Full Of Trees (Redbird Press). His work has appeared in many journals, including,StoneHighway Review, Pittsburgh City Paper, Grasslimb, and on the radio show Prosody. Most recently, he has won second runner up in Finishing Line Press' Open Chapbook Competition in 2013 and was awarded finalist in the Concrete Wolf Chapbook Competition (2013). He lives in Pittsburgh, where he curates a monthly reading series, VERSIFY. Valerie Wallace is an editor with RHINO, the Afghan Women's Writing Project, and leads poetry workshops in Chicago. She has received awards from the Illinois Arts Council, the Barbara Deming Fund for Women, the San Miguel de Allende Writers Conference, and the Midwest Writing Center. Her chapbook, The Dictators' Guide to Good Housekeeping is available from Dancing Girl Press. Bill Wolak is a poet, photographer, and collage artist. He has just published his twelfth book of poetry entitled Love Opens the Hands with Nirala Press. Recently, he was a featured poet at The Hyderabad Literary Festival. He teaches Creative Writing at William Paterson University in New Jersey.